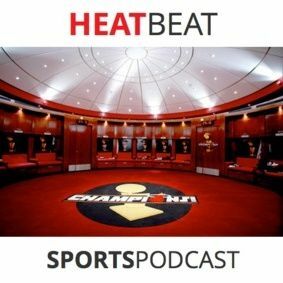 ANNOUNCEMENT: We're about to make a Miami Heat parody song, but we want your help to give us your song suggestions to spoof. Send us your song requests at our Email: heatbeatmiami@gmail.com or our Twitter handle: @HeatBeatMiami, and we'll pick the top ones to record and play on-air! You know you wanna'! SHOWNOTES: We do a little short show, but enough to give you guys something to listen to for this week -- albeit with us talking like Twista. We discuss everything we can in a ... See More 15-minute stretch from Houston win, losing skid, Phil Jackson to the Knicks...and tennis? If you like the show, feel free to send us an email at: heatbeatmiami@gmail.com or tweet us @HeatBeatMiami, @byBrianGoins, & @GNavas103. We want to interact with #HeatNation!